I made a fruit smoothie today. Well, ok…so maybe it’s not really a smoothie. But it does have fresh fruit and milk and it makes me feel better to call it a smoothie, rather than a milkshake. Don’t you agree? You have your fruit, which we all need. You have your dairy, which is good for us, sooooooo….. 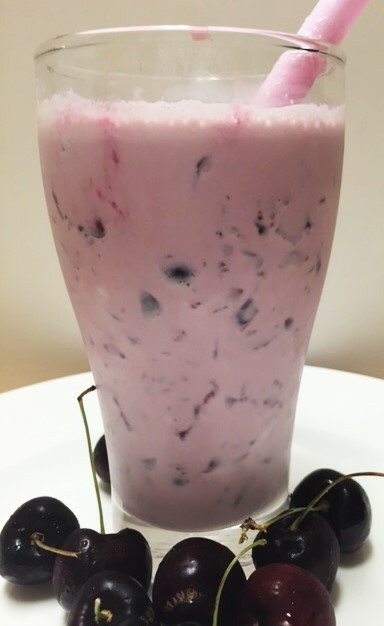 But truth be told, this is a MILKSHAKE. A very good milkshake. 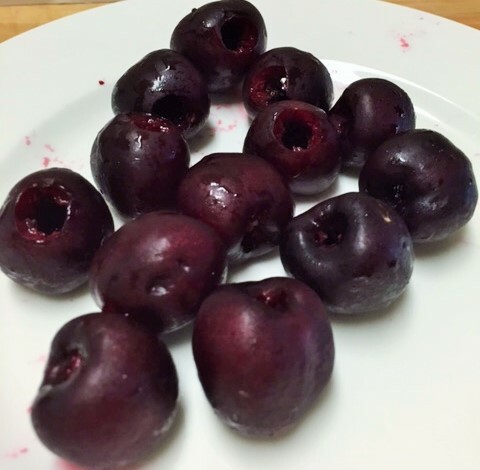 Don’t you just love fresh cherries that are dark and sweet and have that bit of a crisp when you bite into them? The cherries this year, are amazing. My local grocery store has some that come from Washington. They are the best cherries I have had in a very long time. I bought way too many at one time, so I thought hmmm, what can I make with these? That’s when I thought about a fresh cherry milkshake! Ohhhhhh, wow. None of that artificial cherry flavoring. 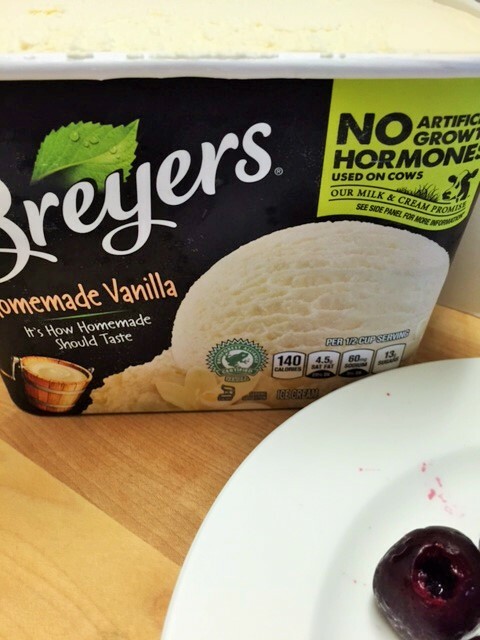 No added sugar…just the natural sweetness of the cherries. Hmmmm, now……what to do with the other 5 pounds of cherries!! Maybe a cherry upside down cake! Stay tuned for that. Note: You can use low fat ice cream and low fat milk, if it makes you feel better. Pour the milk into the blender. Add ice cream. 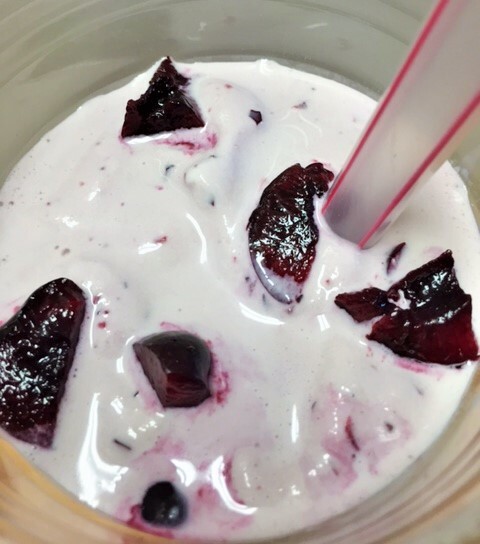 Give it a whirl until the mixture is smooth and thick. THEN you add the pitted cherries and chocolate chips. 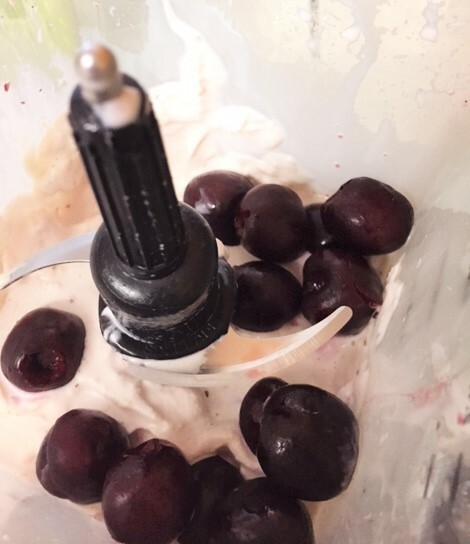 YOU DONT WANT TO ADD THE CHERRIES TOO SOON, because you will want some good chunks and pieces. Gonna try this one! Going to Henderson tomorrow to stay w/grandkids for a few days. Hot there. Bet they’d like this a lot. I’ll be the favorite grandma!!!! Jem, thank you for commenting. yes, you will be the favorite grandma for sure! hhahaha, have a blast. Paula, you must make this! !